Secret Service, Agents Settle Over Racial Discrimination Allegations : The Two-Way A long-running class action lawsuit alleged the Secret Service denied promotions to black agents. The agents , the service and Homeland Security have reached an agreement, pending court approval. 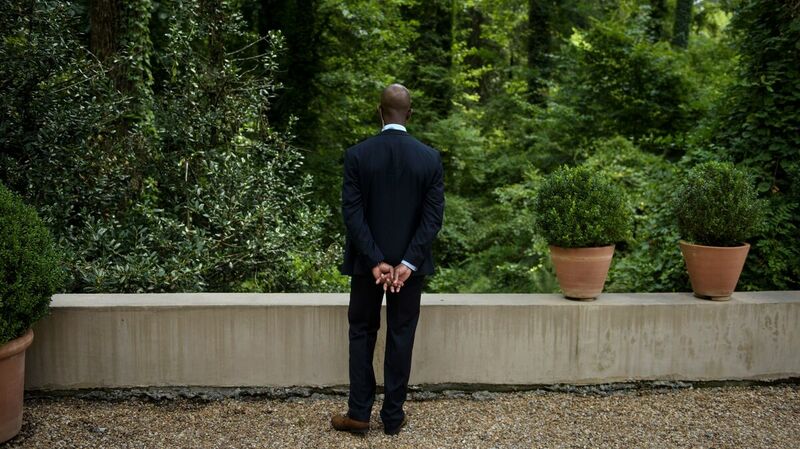 A member of the Secret Service stands guard while President Obama attends a fundraiser for Hillary Clinton in August 2016 in College Park, Ga.
A long-running lawsuit accusing the Secret Service of discriminating against black agents appears to be coming to an end without a trial. The Department of Homeland Security, the Secret Service and more than 100 agents have reached a settlement agreement, the department says. A court still needs to approve the settlement. This lawsuit has been brewing for a long time. It was initially filed in 2000, on behalf of a handful of agents who said they were routinely and unfairly passed over for promotions while less-qualified white agents rose up the ladder. The alleged pattern of discrimination also included racial slurs; unfair assignments, bonuses and hiring practices; and retaliation against people who spoke up to challenge racial harassment. In 2008, a judge excoriated the Secret Service for making a "mockery" of the law by refusing to cooperate in the suit. A Secret Service inspector admitted to destroying evidence relevant to the case. Then the case expanded from 10 plaintiffs to scores of them. NPR's Giles Snyder reports that three years ago, the case was certified as a class action "covering more than 100 black agents." Ray Moore, the lead plaintiff in the case, spoke to NPR in 2007. According to court documents, Moore bid for more than 180 promotions between 1999 and 2002. At one point, the suit says, he was assigned to train the white agent who received the promotion he was denied. He told NPR he loved working at the Secret Service and believed in the mission — which is why he was continuing to serve as an agent while he was suing his employer. "But at the same time, you know, I will let people know that the service has some legacy problems, and that is the institutional racism with the promotional and evaluation system," he said. "There are problems with that system, and that needs to be fixed." At the time — nearly 10 years ago — NPR described the case as "moving slowly." Moore said he was in it for the long haul. "It's going to be a fight because this is a legacy problem that has been around for a long time," he said. "And, you know, people with power never give it up voluntarily."